The contentious negotiations over the fate of the North American Free Trade Agreement have veered into one of the world’s most pressing health issues: fighting obesity. Obesity has at least doubled in 73 countries since 1980. Many public health officials, worried about the rapid spread of highly processed foods, have found hope in a new tactic: the use of vivid warnings on foods with high levels of sugar, salt and fat. Officials in Mexico and Canada — along with governments in Brazil, Peru, Uruguay, Argentina and Colombia — are discussing options like the use of colors, shapes and other easy-to-understand symbols that warn consumers of health risks. They were inspired in large part by Chile’s introduction of stringent regulations in 2016 that include requirements for black stop-sign warnings on the front of some packages. The organization is fighting to keep Chile’s model from being adopted more widely. Roger Lowe, a spokesman for the group — whose board members include executives from Coca-Cola, PepsiCo and Mondelez International, which owns brands like Oreos, Chips Ahoy and Ritz crackers — said it was concerned about the “evidence and impact” of Chile’s laws. Proponents of more explicit labels said the Trump administration’s proposal and the corporate pressure behind it hold the potential to handcuff public health interests for decades. The American proposal conflicts with the guidance from Mexico’s national health institute and from the World Health Organization. Both have recommended that Mexico pass regulations to help combat diabetes, which claims 80,000 lives a year there. That is one of the highest rates in the world — and more than double the record number of homicides in the nation in 2017. Mexico’s Ministry of Health, which is directly involved in the trade negotiations, said it was reviewing the American proposal with the nation’s health authorities. Public health experts have hailed Chile’s rules as a new standard. They include a ban on the use of cartoon characters like Tony the Tiger, but the package warnings are considered the most aggressive of the tactics. Food companies have been forced to take note. Over the past two years, more than 1,500 products have been reformulated to make them healthier and to avoid having to carry a warning logo, according to AB Chile, a food industry association. But passage of the regulation in Chile did not happen without a fight. Eleven countries, led by the United States, raised issues with the proposal before the World Trade Organization. The Chilean government successfully argued that the measures were a necessary tool to fight the nation’s mounting obesity crisis. Today, Chile’s success has inspired nutrition advocates around the world, including those in Mexico. “The fact that the industry is freaking out is reassuring, but at the same time it’s worrisome that the U.S. government is trying to defend the position of the food industry,” Dr. Corvalán said. All told, at least 23 countries use some version of front-of-label consumer education. Some of the warnings already adopted or proposed include black boxes or red octagons that draw attention to foods that regulators deem unhealthy, using less intense imagery but the same approach as cigarette packaging. Still, public health experts consider most of the labels other than those required by Chile to be relatively weak or ineffective. Heading off pressure for more explicit warnings through the Nafta negotiation is especially appealing to the food and beverage industry because it could help limit domestic regulation in the United States as well as avert a broad global move to adopt mandatory health-labeling standards. In most cases, trade law allows governments to retain the right to make rules in the interest of public health, experts say, but the proposal by the United States appears to be aimed at curbing that. Ms. Jones of the George Institute said research found that trade policy had also been used to try to block efforts to adopt warnings in Ecuador, Peru, Thailand, Chile and Indonesia. Chile has moved forward as has Ecuador, but with a less aggressive labeling system, Ms. Jones said. One reason that the warning labels are seen as so vital to the efforts to curb obesity is that consumers appear to heed them. Mexico’s current labeling rules allow for — but do not require — the display of daily intake recommendations of salt, sugar and fat. But they are “indecipherable to consumers” and “totally useless to people,” Ms. Jones said. Government researchers at Mexico’s National Institute for Public Health recently found that only 17 percent of consumers bothered to look at the front-of-pack labels mandated by law. In separate research, scientists asked college students to try and crack the current labeling system, which, to use effectively, requires mathematics. “These college kids couldn’t even do it,” said Dr. Simón Barquera, the director of health research and nutrition policy at the Mexican public health institute. After starting a campaign several years ago to impose a tax on soda, Dr. Barquera and two other backers of the soda tax were targeted by sophisticated spyware sold only to governments on the explicit understanding that it be used strictly against terrorists and criminals. 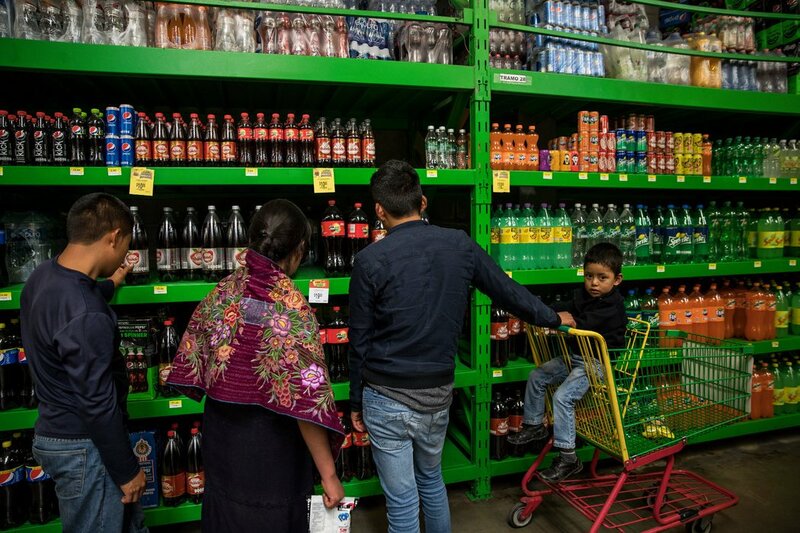 Mexicans drink on average 167 liters — more than 44 gallons — of soda a year per person, eclipsing what are considered high consumption rates in the United States. In some remote areas of the country, soda is more readily available than clean drinking water.